Thoughts from Polly's Granddaughter: Did Warren invent the story of racist grandparents? In 2012, while running for the US Senate, reporters at the Boston Herald discovered Elizabeth Warren had listed herself as a minority in law directories that were often used for hiring purposes. It's believed by many that Warren listed herself as such in order to game the system and take advantage of affirmative action. Those beliefs are supported by the fact Harvard used her for diversity purposes and considered her Harvard Law's first "woman of color." 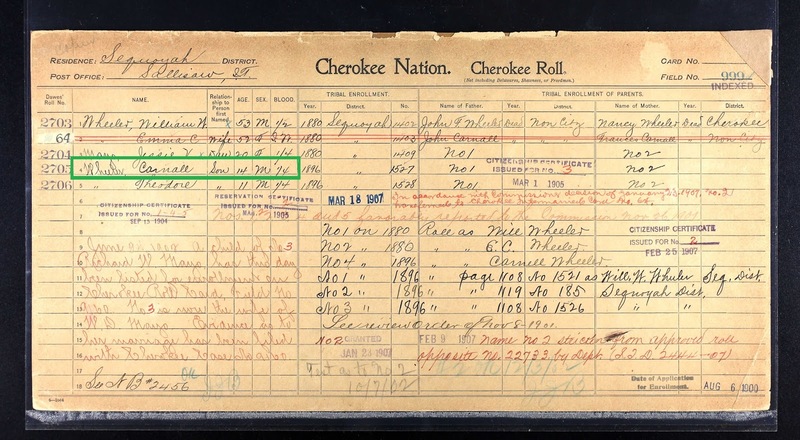 When questioned about listing herself as a minority, Warren said she was Native American and she further elaborated by proclaiming that her parents had to elope because her father's parents despised Indians so much, they refused to allow him to marry her mother, a purported Indian. The problem with Warren's story is that none of the evidence supports it. Her genealogy shows no indication of Cherokee ancestry. Her parents' wedding doesn't resemble an elopement. And additional evidence doesn't show any indication of her Herring grandparents being Indian haters. 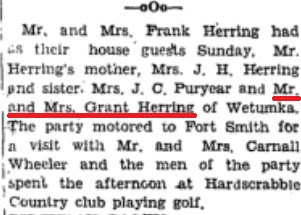 In 1937, Elizabeth Warren's paternal grandparents, Grant and Ethel Herring, made the one and a half hour trip from their home in Wetumka, Oklahoma to Sallisaw, Oklahoma to visit Grant's brother, Frank Herring. Later all of them made a thirty minute drive to Fort Smith, Arkansas to visit Frank's brother-in-law, Carnall Wheeler, and his family. While the women stayed at the Wheeler home to visit, the men spent the day playing golf at the Hardscrabble Country Club. Democrat American, Sallisaw, Oklahoma, September 30, 1937. Click to enlarge. That snippet from the Society Pages may seem rather mundane and insignificant but it isn't. While Warren has repeatedly said her paternal grandparents disliked Indians, this news clipping indicates otherwise. The man Warren's paternal grandpa spent the day playing golf with, Carnall Wheeler, was an Indian and listed as one-fourth Cherokee by blood on the Dawes Roll. 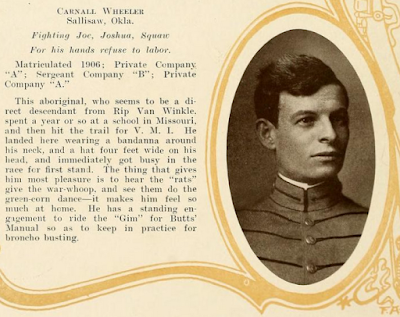 It was no secret that Carnall Wheeler was an Indian. 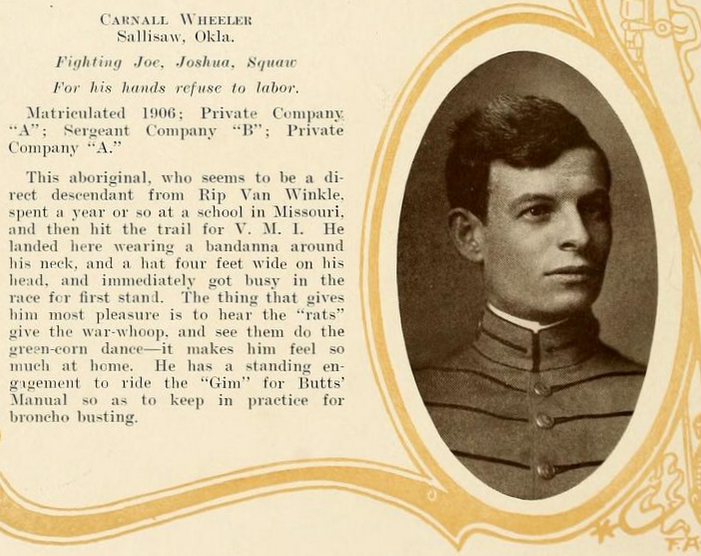 Upon his graduation from the Virginia Military Institute in 1909, his biography referred to him as an "Aboriginal" and there were biting references to war-whoops and the green-corn dance (rats appear to be new students.) One of his nicknames was listed as "Squaw." Wheeler's biography is uncomfortable to read because there are racist remarks included but it leaves no doubt that people knew he was an Indian. The golf outing was not the first time Warren's paternal grandparents met Wheeler. He was in attendance at the 25th wedding anniversary party for Frank and Kitty Herring in October 1936. Warren's paternal grandparents attended that party so they knew who he was. They made a conscious decision to accompany Frank to Wheeler's house in 1937. They could have excused themselves from the visit in a number of ways, but they chose not to do so. Clearly, Wheeler experienced some degree of racism in his life due to his being Indian. Despite this, there is one person we know who did not have a problem associating with him -- Grant Herring, the grandfather of Elizabeth Warren, the same grandfather she claims was racist against Indians.